Brand new colorways, Mini sets, and a shop update! Happy February all! We made it through the first month of the year and I think that’s cause for celebration, don’t you? 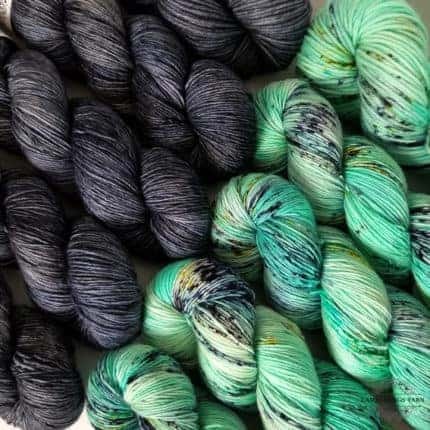 How about a pretty yarn shop update? Last month our new colorway (Birch) was about “new year, new beginnings, hope, and renewal.” This month, I’m applying that idea to dye pots, stepping out of my comfort zone color-wise, and improving on past creations. So, I’ve been hard at work here in the studio all week dyeing up some brand new colorways and revamping some old ones. 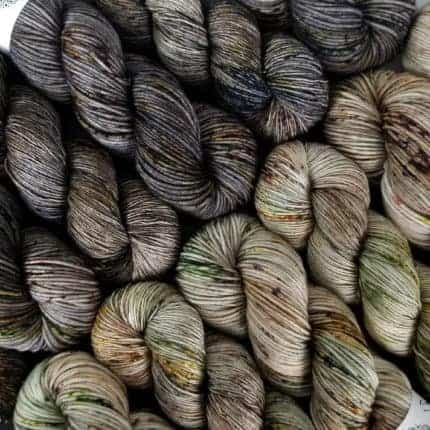 Our new colorways include Petrichor (minty aqua with speckles), Tall Tales (medium tan with nuetral woodsy speckles) and Buried Alive (dark grey brown with dark speckles). Shown above. Colorways that got a face lift include Amethyst (cool purple gem tones) and Phantom (cool charcoal grey). Also shown above. 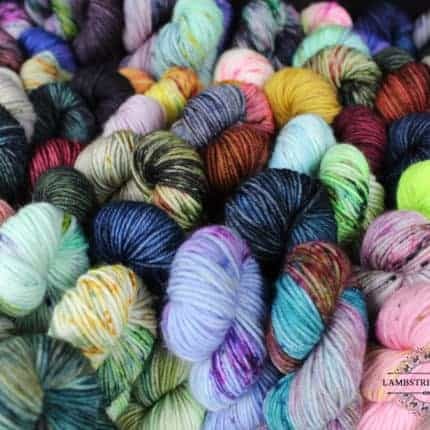 All five colorways are available and ready to ship on Saturday, February 2nd, 10 a.m. EST at LambstringsYarn.com on Sadie Singles, Tralala Sock, and Ewetopia DK bases. We’ve also added Mini skein sets to the shop! 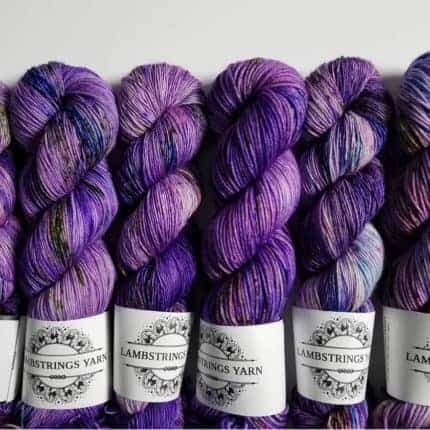 FINALLY, mini skeins sets are no longer limited to fiber festivals and fairs! These are sets of six mini skeins on our Tralala Sock base (92yds/skein, 552 yds total) put together in fun color combos by yours truly! Lots will be in the update, but they are mostly unique combos so make sure you act quickly. The shop update will be Saturday, February 2nd at 10 a.m. ET. I hope you can make it!